If you love watch TV, movies and your favorite TV shows but didn’t want to spend thousands on purchasing the digital Dish Receiver. No problem, as the official website of the Telebrands PAKISTAN has come up with a unique product that all the entertainment freaks will definitely find useful. The name of this top quality product is Android Smart TV BOX MXQ 4K WiFi. The Android Smart TV BOX MXQ 4K WiFi, as the name clearly indicates, is a top quality Android TV Box that is designed to show the nearly all TV channels with minimal possible time, effort and money. 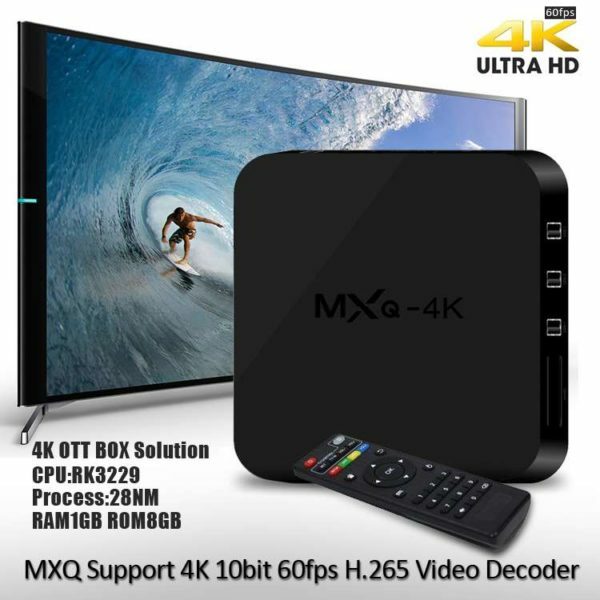 One of the best features of the Android Smart TV BOX MXQ 4K WiFi is that it supports the 4K resolution, means that now all the users can easily enjoy their favorite movies, dramas and TV shows in exceptional 4K quality resolution. The Android Smart TV Box MXQ 4K WiFi is powered by the powerful RK3229 Quad Core CPU with clock speed up to 1.5 GHz. As far as the memory option of this device is concerned; the Android Smart TV BOX MXQ 4K WiFi is equipped with 1 GB DDR3 ROM and 8 GB Internal Memory. Moreover, the device has also the slot of MicroSD card that allows all the customers to easily insert the memory card in the device up to 32 GB max. The Android Smart TV BOX MXQ 4K WiFi is powered by the Maali-400MP GPU and it supports OpenGL ES 2.0. The Android Smart TV BOX MXQ 4K WiFi supported different resolutions as the MPEG, HVEC, Xvid, MKV, WMV, MPG and so on. The Android Smart TV BOX MXQ 4K WiFi also support the different audio format as the MP3, AAC, WAV, WMA, AC3, FLAC and so on. The Android Smart TV BOX MXQ 4K WiFi features different ports as the 4 x USB Ports, 1 x SD Card Slot, 1 x AV, 1 x HDMI and so on. The Android Smart TV BOX MXQ 4K WiFi also features the 2.4 GHz WiFi that allows the user to easily synchronize and connect the Android TV box with the home or local WiFi. The Android Smart TV BOX MXQ 4K WiFi also supports the Google Play Store and it allows the user to install any APP from the Google Play Store as the Skype, Youtube, Netflix, Twitter and so on. The Android Smart TV BOX MXQ 4K WiFi also features the dedicated Infrared Remote Controller that allows the customer to easily control each and every function of the Android Smart TV BOX MXQ 4K WiFi just by pressing the button. If you want to place an order of this top quality product, then you can easily do so just by adding the product in the cart or you can also place an order by dialing the number 0333.4115583 from your landline or mobile number.